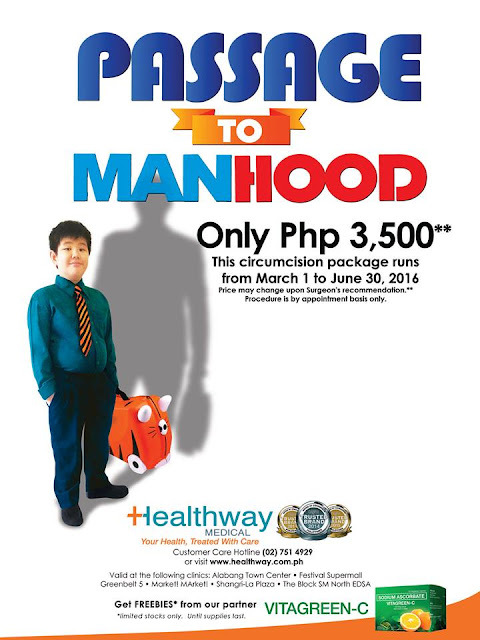 Summer time is TULI (Circumcision) time in the Philippines especially for boys aged between 11 to 14 years old. My son is 12 years old and is an incoming high school student this school year. When I consulted his pediatrician some years ago about the best time to have him circumcised, he said as long as the boy is ready in all these aspects: physically, psychologically, mentally, and emotionally. I took his advice by heart and my son and I agreed that this summer's "his" best time to have it done. We're glad he wants it done now not because of peer pressure or "pang-aasar"of his classmates and friends, but because he's really ready. With all the horrible stories told to him about his uncles about circumcision to scare him off, he asked if it's really painful and if there's an option to go painless. Luckily, he lives in this era when non-surgical or laser procedure is already made available for a painless (and bloodless) circumcision. I tried searching online but the list of clinics isn't enough, so I called a few hospitals and clinics near our place of residence to ask about their packages and I want to share this list to you dear moms of boys. In my quest for the best and most practical circumcision packages, I found out that there are THREE (3) ways to get it done! I didn't include the traditional pukpok anymore of course, that would be horrifying to the boys! The procedures are: 1) Surgical; 2) Laser (our preferred one); and 3) Cautery. So I will divide my list below based on the procedures mentioned. For the choice of cut, there are also two popular cuts: Dorsal Cut (called loose circumcision, with extra skin at the bottom of the shaft), and German Cut (called tight circumcision, removal of the extra skin so shaft is very clean). Price: Php 1,000.00 (Summer Promo, originally at Php 3,500.00) for Laser procedure only; Php 2,250.00 for Laser procedure with medications. This is for Dorsal cut only. German cut has a different price. View list of clinics and contact numbers HERE. My list is limited to Manila, Quezon City, Taguig, Ortigas, and Cainta areas only since these are the areas accessible and quite near to where we reside. If you have information of other clinics offering circumcision packages in Metro Manila, please comment below so I could also include it here. We plan to have my son circumcised towards the end of May after all his summer activities are done. I will be posting about my experience, as the mom of the son being circumcised, and not of my son's. Alam niyo na, binata na and I don't want to embarrass him as well! Until then loves! Hope this post helps!